We Know Our Lust List Winners! Over 400 of you took our Lust List survey this year and the results are in! Some perennial hotties and some new heart-throbs on the scene. 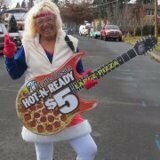 ...the Little Caesar's Lady for Hottest Celebrity and for Hottest Over 50. Good showing Little Caesar's Lady! Don't miss our next issue for all the lovely pictures.